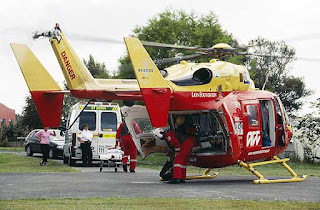 I just watched an episode of Rescue 1 which follows a rescue helicopter crew to jobs. The Advanced Paramedic had responded to pick up a rugby player with a suspected neck injury. The patient had been packaged onto a stretcher with stiff neck in place. He was lying there with a worried look on his face. The Advanced paramedic leaned over him and put a hand on him and uttered those magic words. "Everything is going to be ok"
He went on to explain what had happened, why they had packaged him that way and what was going to happen next. Because I have been a patient and I know how terrifying it is lying there imagining all the terrible things that you think is happening or going to happen to you. Your lack of knowledge or understanding, even as a clinician, results in you thinking the very worse and fear can really overtake you. Hearing those words of absolute reassurance that everything is going to be ok from the ER doctor simply melted away all my fear. Yet how many of these routine patients do we attend to and forget to include in our standard treatment regime some simple reassurance of the patient that everything is going to be ok? It is probably one of the single most effective parts of our treatments. Alleviating fear reduces heart rates which in turn reduces myocardial oxygen demand so not only does it have psychological effects, it also has positive physiological effects. Now it may well be true that the patient is very ill and my deteriorate but the fact is, while they are in our care we have all the tools to help them, so for the patients benefit everything will be ok and they need to know this. So next time you attend that patient and are busy sticking IV's in them, hooking them up to your monitor, taking their blood pressure and sticking an oxygen mask on their face, dont forget those magic words.....everything is going to be ok. Trust me, your patient will thank you for it.